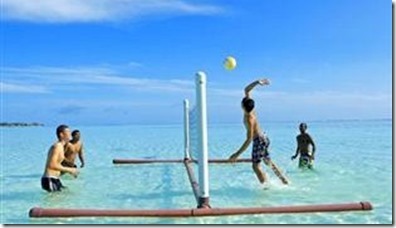 An even more authentically Maldivian water sport is Angsana Velavaru’s lagoon volleyball. Offered each day from 6:00 to 7:00 pm free of charge. Great for those ‘diving’ digs and pancakes. International Day of Sport for Development and Peace today. As you explore sport around the world, one of our favourite pub quiz questions is “What is the SECOND biggest sport in a country?” That’s because, working in the sports industry as I have been, you quickly learn that there is one major sport in the world that has lots of completely different styles, but only one name – “Football”. Soccer, American Football (NFL), Aussie Rules. Completely different games, but one shared name and all dominant in their countries. So number two is intriguing as well as diverse. 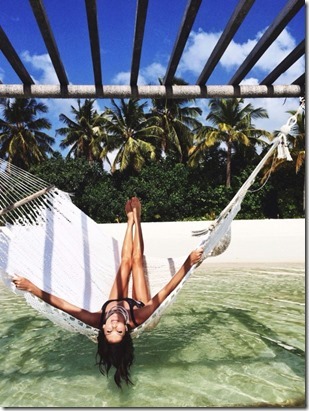 The Maldives is no different with Football being the most popular. 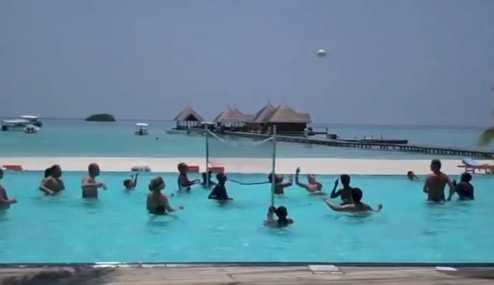 And it’s #2 sport, at least among the resort workers, the #2 sport is Volleyball (same as Brazil). 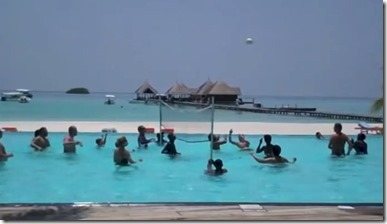 And in the Maldives, there are all types of volleyball. Most resort staff field serious teams that play other resorts with regularity on some quite sophisticated courts. 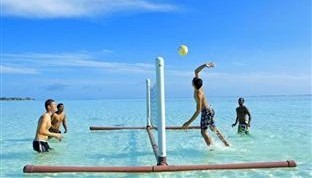 Maldivians play court volleyball, beach volleyball…and of course water volleyball. 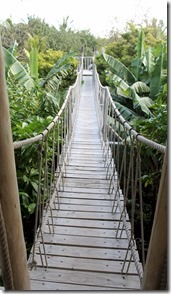 And the resort where it is most prevalent is Club Med Kani. Kani’s main pool seems to always have some sort of major group activity going on and volleyball is one of the popular ones. 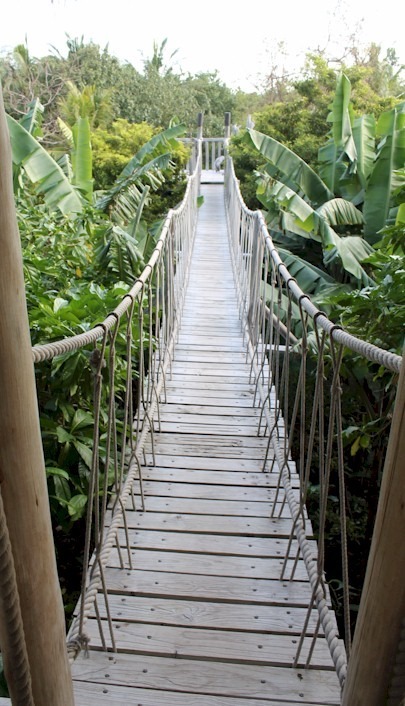 No “Swiss Family Robinson Chic” (with a little bit of “Indiana Jones Panache”) is complete without the treetop rope bridge. 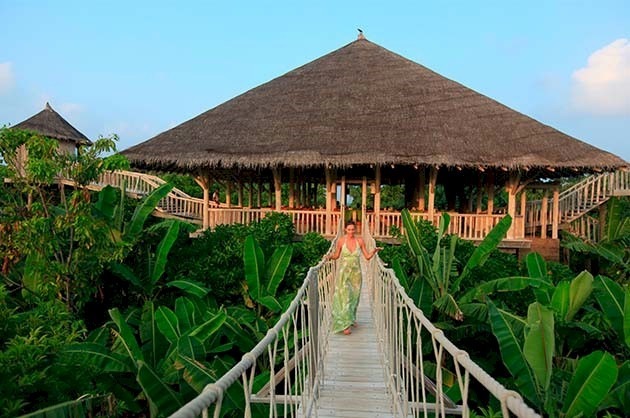 In Soneva Fushi’s case, it overlooks the lush tropical canopy leading to its “Fresh in the Garden” restaurant. They also have a more solid sinuous bridge leading to its observatory if you prefer your spectacular view to be upward rather than downward. As much as people think about the underwater landscape of the Maldives, I enjoy just as much the view down on the mottled blue landscape. So it’s great when resorts offer a slightly elevated platform from which to enjoy the cerulean scene. 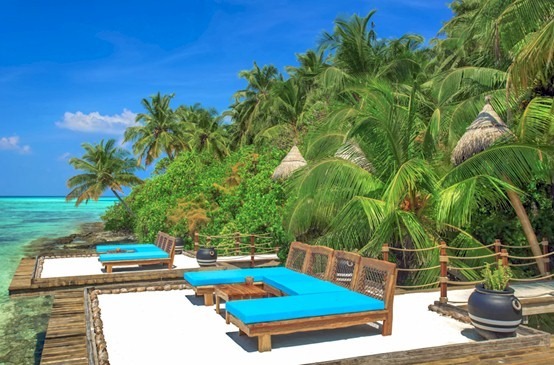 A number of high decks are available on resort islands, but Nika’s water villas provide a great platform from the comfort of your own vacation home and smack in the centre of the azure action. 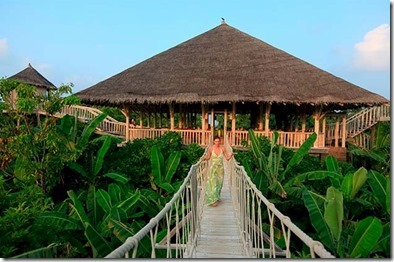 I’ve titled it “Standard Water Villa” because Six Senses Laamu also has a water villa roof deck, but it is a significantly higher cost band. From Carolina Amora’s snap above, it looks like a nice view to me (the ocean looks good too). 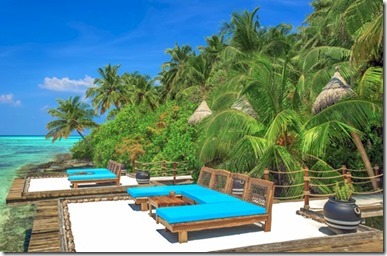 With the cancellation of the Sri Lankan Airlines direct service and British Airways curtailing its own London-Male service in the summer months, most UK travel to Maldives has required the tedious stop-over. 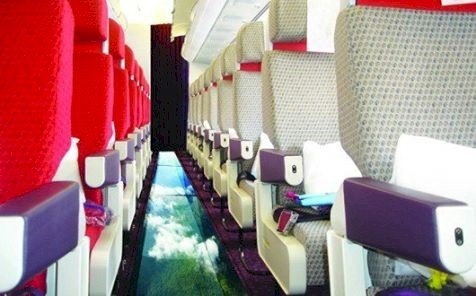 But the customer-focused Virgin Airways has not only stepped into the breach with its own daily direct service to the Maldives, but it has done with an aeronautic innovation so appropriate to the destination…glass bottomed planes. Using the same pressure-resistance, high tensile strength glass that the famous underwater restaurants there use, every seat is a window seat! The scenic wonder is ideal for that climactic arrival to the otherworldly archipelago as the distinctive tapestry of blues emerge in the seascape below. I much prefer these windows-full planes to the windowless planes the industry has been talking about recently. 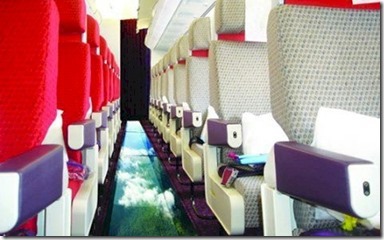 And lest you think this can’t be real, see the full details on Virgin’s website – “Virgin launches glass-bottomed plane”.